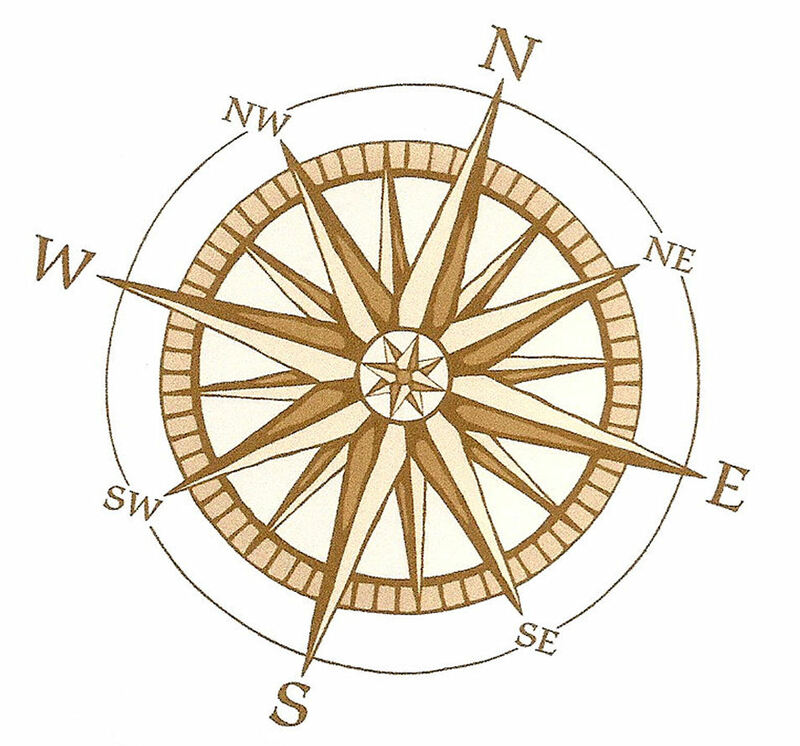 Before GPS became available to civilians, the compass served as a way to find direction. But when it comes to art, and this week’s affirmation, neither of these offer much help. In fact, orienting toward my work is full of interesting twists and turns. First of all, there is the challenge of word choice. Besides my artistic work, I have the work that pays the bills and I must orient toward them both. Fortunately, both are creative. I earn my living making custom boat covers which is like tailoring on a very large scale. The work is satisfying and physical and I am often outside patterning by the salt water. The work is also demanding… requiring a tight schedule, reasonably good weather and sometimes, I would rather be making art. So when I think about orienting toward my work I feel confused. Which work? The question is furthur complicated by my other paying work… bookkeeping. Some days I feel like a juggler. Each of these works is self employment and so I must make decisions every day. And I don’t really like making decisions. So how shall I manage to orient? My Winston dictionary includes five definitions of the verb. The last one says “to set right in relation to some fixed rule or principle”. Certainly one fixed principle is the bills I have to pay! If I make my decisions based on that, I have some structure to build my art time around. But if I am not careful and spend too much time capturing ideas, there is nothing left for deep writing or abstract painting. I need some centering principles. Last fall, I received a flyer in the mail advertising some new bookbinding classes. I was so taken with the beauty of the flyer, done in Letterpress style, that I decided to build a collage around it. The materials came from what I had on hand plus a serendipitous find at the thrift store: branches and leaves meantt for decorating fireplace screens. Perfect reminder of my creative force. This week, I placed the collage on the back wall of my studio next to my newly remodelled office space. 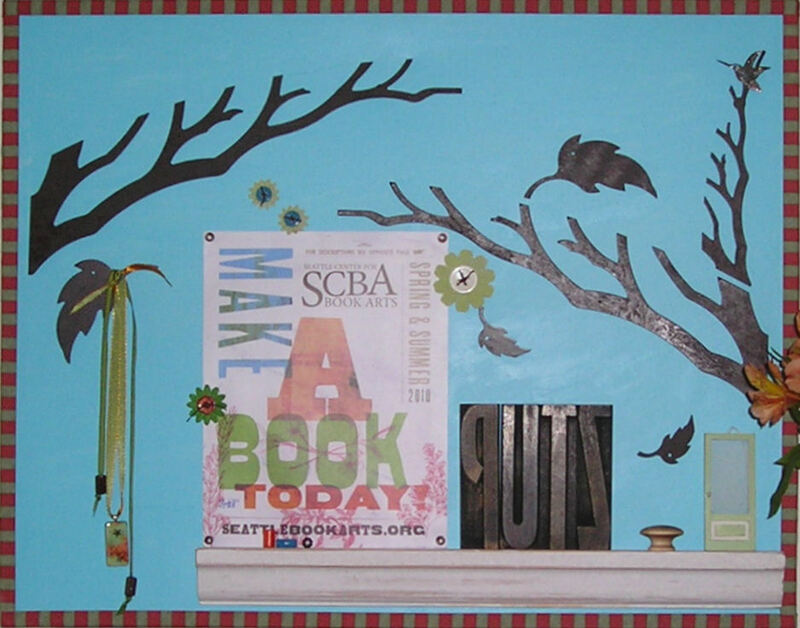 The words “make a book today” inspire me to carve out time for art every day. Even if it is just an hour in the morning. I have also made a weekly schedule that includes art days. Whole days. I make dates with my buddies (follow Kelly’s orienting here) so that I honor those days. And on the other days, I do my best to buckle down and orient towards my other work. I allow some flexibility, but not a lot. I know my weaknesses. I also know my strengths and trust in my ability to make course corrections along the way. It’s an interesting life… never boring. You might say I have found my true north…that tender place of contentment that brings me back again and again what is vital. The best compass and centering principle, it turns out, is listening to my heart. I will orient toward that. I love what you did with the affirmation this week. I am especially impressed with the way you relate the affirmation to multiple sources of creativity. I think one of the strengths in this piece (and in the entries preceding it) is your ability to define a problem for investigation and frame your “assay” around it. You’ve given me something to think about. Thanks, Kelly. This one gave me the most to chew on so far. Looking forward to seeing what Friday brings. Yippee!! !